Take a walk along the edge of the woods right now and the delightful aroma of honeysuckle will hit you. You might not embrace the sight of those aggressive vines, but the white to yellowish pairs of flowers are striking and loaded with sugary juice. Honeysuckle fragrance is incorporated into perfumes and soaps, but there are many more uses for this unique flower. Children everywhere have pulled off these delicate blooms and sucked the sweet nectar from them. Mothers need not worry. Those flowers are not poisonous. They make a fine herbal tea and can be used in cooking. Collect the flowers and briefly boil or steam them. Puree the mixture and add it to your favorite sugar cookie recipe, remembering to reduce the liquid portion of the dough a little. The distinctive but delicate flavor makes a great change of pace. I’ve seen recipes for frozen honeysuckle sorbet and honeysuckle pudding, but I’ve never tried them. There are several jelly recipes posted on the internet. This vine will lure butterflies and hummingbirds to your yard. There is one problem though. This Asian introduction is one of the most prolific species anywhere. It is on the invasive species list for nearly every eastern state. There are native honeysuckles, but by far the most common species encountered in eastern North Carolina is the Japanese honeysuckle (Lonicera japonica). Don’t dig it up from the wild and transplant it in your yard. We don’t need to encourage it one bit. The birds spread enough seed around already. This species is best left to the fringe places where forests and open areas meet. It provides cover and food to wildlife, though it also out-competes most of our native plants. Vines can grow to the treetops and totally mask shrubbery. They climb on anything that will support them. Japanese honeysuckle is a perennial woody vine that spreads by seeds, underground rhizomes, and above ground runners. It has oval leaves that emerge from the stem in pairs. They are about three inches long and semi-evergreen to evergreen. Older stems have brownish bark that peels in long strips. Berry-like fruits are black when mature. Avoid the seeds as there is mixed information concerning their toxicity. Some sources list them as quite poisonous. Foliage is questionable as well, though it is used in Asia extensively for medicinal purposes. Japanese honeysuckle has anti-inflammatory and diuretic properties. 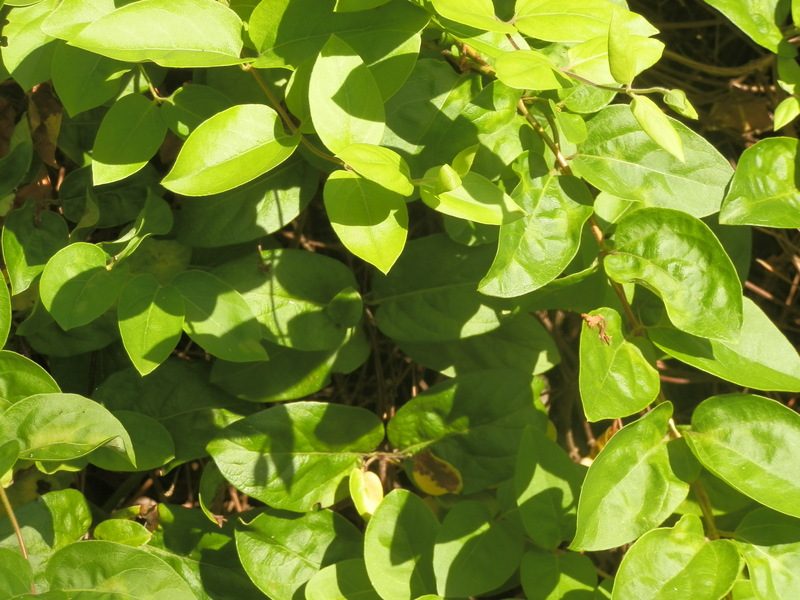 Most homeowners would like to rid their properties of these pesky vines. Plants were introduced in the early 1800’s and they have all but assumed their victory over us. I’ve had the most success controlling honeysuckle by cutting it to the ground and spot-treating the freshly cut stumps with concentrated Round-up. Use the kind that is at least 41 percent glyphosate. Two problems with this method are that you must be careful not to use too much chemical and you can’t hit any non-target plants. I shy away from foliar applications since it’s too easy to contact landscape flowers and shrubbery. The increased volume of spray makes it almost impossible to avoid desired plants. 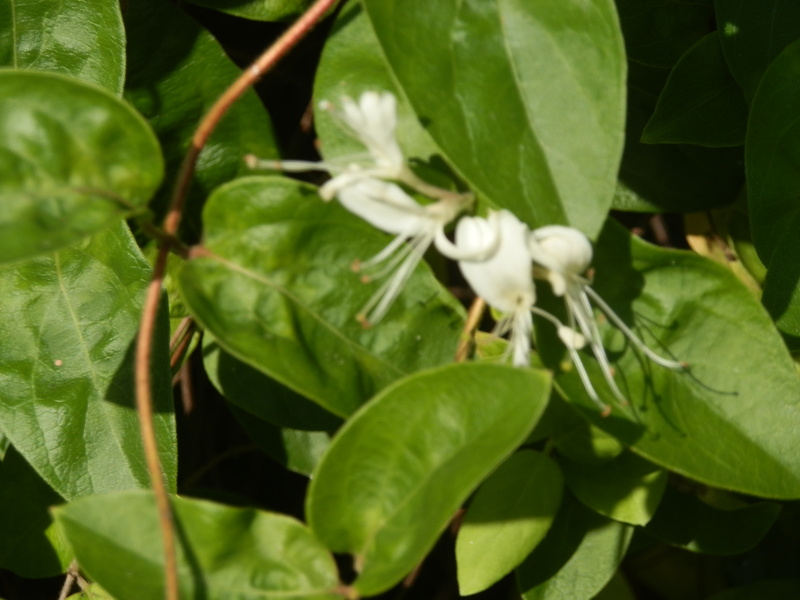 This entry was posted in foraging and tagged chemical control, invasive vine, Japanese honeysuckle, Lonicera japonica, nectar. Bookmark the permalink. Never knew that you could bake with the honey suckle plant. Could you also do that with the Japenese honey suckle? Is the honey suckle being over runned by the Japnese honey suckle? I remember this flower when i was little and when i was in the 2nd grade And i remember the sweet netar and the japenese honey suckle. kinda odd; such sweet necter it can give you, but the seeds may be poisinous and need to be avoided. seems kinda backwards. This plant is very unique, I’ve actually have drank the nectar from these all the time when i was in elementary school because they grew on school grounds and they were very sweet and tasty. Its not only good for its sweet aromas but good for the flavors it gives. when you first read this its seems like a nice and sweet plant by the it starts off then as you read on it says that the seeds are poisinous and need to avoid the plant. seems kind of weird but i have heard you talk about other plants that are like that. i thought this plant was safe cause every time i see one i go and drink the juice. I didnt know this plant was harmful and by looking at it i would of never guessed it to be. I used drink the nectar all the time when i was younger, I never knew the seeds in this plant were harmful though. This plant can be used for many things including recipes, medical purposes, and for their aroma. I had no idea that the seeds were poisonous. This plant can be used for recipes, medical purposes. but I didn’t know they would be harmful.